This does happen from time to time, though I agree that the chances anyone does it for Manziel are basically zero. Oakland actually just did this in April with Aldon Smith, re-signing him to a one-year deal with an additional option year, even though he will be suspended up until November. Basically they'll only pay him for the very end of the season, and then decide if they want to pick up the option to keep him next year. Of course, Aldon Smith is a devastating player when his idiocy doesn't keep him off the field, whereas JFF has never shown more than the smallest fleeting hint of being capable of playing NFL level quarterback. Any chance he plays arena or CFL ball? CFL, no. They have a rule that an NFL player under suspension cannot be signed to a CFL roster. That's why Josh Gordon was unable to go to the CFL a couple years ago when he wanted to try and do that. As long as Manziel's NFL suspension remains unserved, the CFL is completely off the table. What in the hell are you talking about Legion? It's Friday, he's going stone cold sober after today. Duh. I must have missed the celebratory "I did it!" press conference. The Browns cut Connor Shaw. The Saints put a waiver claim on him, and did not keep quiet about it, even announcing a player release to make a roster spot. The Bears, with one spot better waiver priority than the Saints, jumped in with a claim and got Shaw. Though I doubt the Bears suddenly decided they wanted Shaw because the Saints did, it's still amusing. Anyway, Paleo, here's the rest of the answer to your question. Cian Fahey breaks down Joe Flacco. tldr? Flacco is all about the business decisions and resulting bad throws. Rough, rough article if you're a Flacco fan. At work so I haven't read the article yet, but I watched the GIFs, and my god that footwork. That's the kind of footwork that, if I saw on a college player that's hyped as a 1st round pick, my reaction would be LOL NOPE. Also was amused at the very last one, where they run four verticals on 4th-and-11 and he throws the 5-yard hook to the fullback. That probably was the primary target on the play, thinking they could clear out the middle of the field with the 4 verts, but the MLB stayed on top of that route the whole time, and the defenders to each side also only dropped to the first down marker, they only slightly trailed the inside receivers up the field. And you could tell the FB was probably the first option by how he he's looking right at him the whole play. An interview with Calvin Johnson is airing tonight and some pull quotes are already making headlines. They shouldn't shock anyone. Been a while since Legion got a new jersey . . . If only the Browns didn't change to those horrible new jerseys, it could be revised into a Tim Couch jersey. I'm a day late, but just saw this on my Facebook feed. Yeah, snacking in the middle of the night is probably a bad idea, Karlos. [T]he Browns had the power to void Manziel’s guaranteed money in various ways: (1) a suspension imposed by the league under any policy; (2) a suspension imposed by the team; (3) failure or refusal to report, practice, or play; or (4) leaving the team without prior written consent. That idiot gave them all four scenarios. He didn't even put up a fight when they did it. 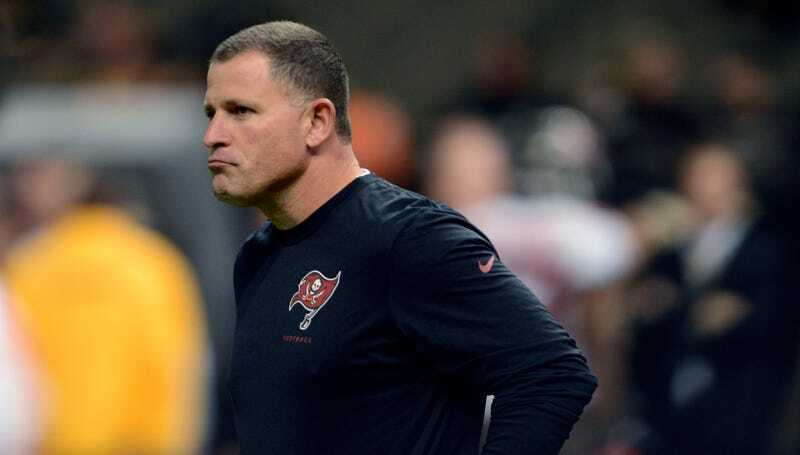 New reasons to find Greg Schiano repugnant; a report says Schiano knew about Jerry Sandusky's sexual abuse of young boys back when he was an assistant coach in the early 90s. The animation in that football game is just terrible. We get warping like that in Winnipeg all the time. It's kind of a problem. Tom Brady will have to serve his four-game "Deflategate" suspension -- unless he wants to try to take it to the Supreme Court. A federal appeals court has rejected the New England Patriots QB's request to have a hearing before the full 2nd U.S. Court of Appeals, thereby upholding the suspension handed down by NFL commissioner Roger Goodell. LOL this is Tom Brady and his massive ego.. of course he is going to try and take it to the Supreme Court.. I mean this is just like Ali's case right?? My gawd, Fox Sports's site design continues to go down the worst path. What a horrendous looking site. I stopped visiting there a couple years ago and that clearly was the right choice. No way do you prefer that over ESPN! I get people not preferring the new look, but at least it is functional. And really, it's pretty easy to find what you want. I really don't know what people hate about it. I really don't know what people hate about it. They disabled control-clicking on links for some stupid f*cking reason. Useless twitter feed taking up real estate. You have to wait for all of the icons to load on the top score feed to load (which can sometimes take a surprising amount of time) before you can even click on a f*cking box score. The way they sort articles is nonsensical. Need more? It's been many years since I've looked at Fox's site but on quick glance it seems better than the current iteration of ESPN's. I am surprised that they don't have a football robot dancing in the corner. Fun fact: the Supreme Court justice in charge of getting what the 2nd sends them is Ruth Bader Ginsberg, who has mutual beef with Tom Brady's good friend Donald Trump. Since football people are involved, Daniel "Harry Potter" Radcliffe reads off the nominees and winners of Deadspin's worst tweet awards. Can we get him in a booth on Sunday? Last year, Justin Tucker was 4th in touchbacks, despite being only 19th in kickoff attempts. In other words, he's a touchback kicker in a brave new mortar kickoff world.